This is a rerun from last year. And, it’s not because I’m lazy. I went into the kitchen this morning and prepared two Thanksgiving leftover dishes that I think are divine and creative. But, not as cute as this and not as easy as this, although Mr. Spinach Tiger probably wishes I would have done something differently this morning because I wouldn’t let him eat anything until I was satisfied with the pictures. He is eating with gusto, as I type, proof of the goodness of leftover cleverness. He is so patient because he helped me prop and shoot today, and I wouldn’t let him take one bite. He promptly cooperated because he knows the hand that feeds him and we opened wine for lunch. I know what I need to do when I need to do it. But, those posts are for tomorrow. I pulled this from the archives with a different picture because it’s my all time favorite leftovers Thanksgiving dish. It gives the cook a break, and it captures all the flavors of yesterday with a whimsical twist. Mix your stuffing, turkey, (can get rid of dark meat here), mashed potatoes, shredded brussels sprouts, corn and if possible, some freshly sauteed celery and onion. There is a recipe here, but you can create your own. Have a great day with family and cash registers. I hope you get all the bargains you are looking for. Come back tomorrow and see what other kinds of leftovers you can do. Hint: get yourself some fresh brussels sprouts and save some mashed potatoes. Tell me, do you go for the mad Black Friday rush or do you stay home avoiding the crowds? 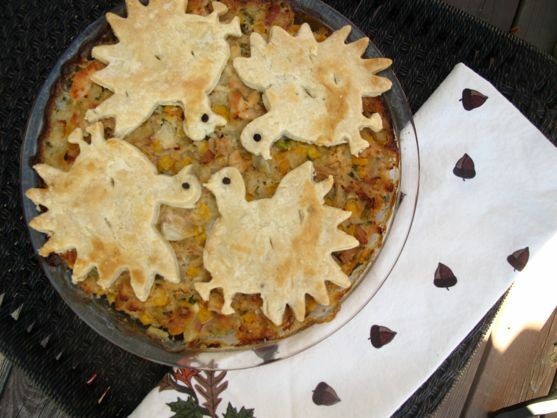 I love that topping with cute turkeys! So prettily decorated! A great and savory way of using leftovers. I have never seen a crust so cute. We don’t have Black Fridays in Canada.